We were recently sent a link to The Big Hedgehog Map and it looked like something worth passing on. It’s a Google Maps mashup and is set with a ‘placeholder’ postcode – SW8 4BG – the HQ of the People’s Trust for Endangered Species. Tap you own postcode in the box, hit ‘Return’ and discover Hedgehog sightings in our area. Why not map your hedgehog sighting, using the simple form? Squirrels – love ’em or hate ’em? Restaurants serving up the furry rodent are seeing a rise in demand as customers look for wild meat sources. Squirrels? They’re just rats with bushy tails and better PR! Oi! 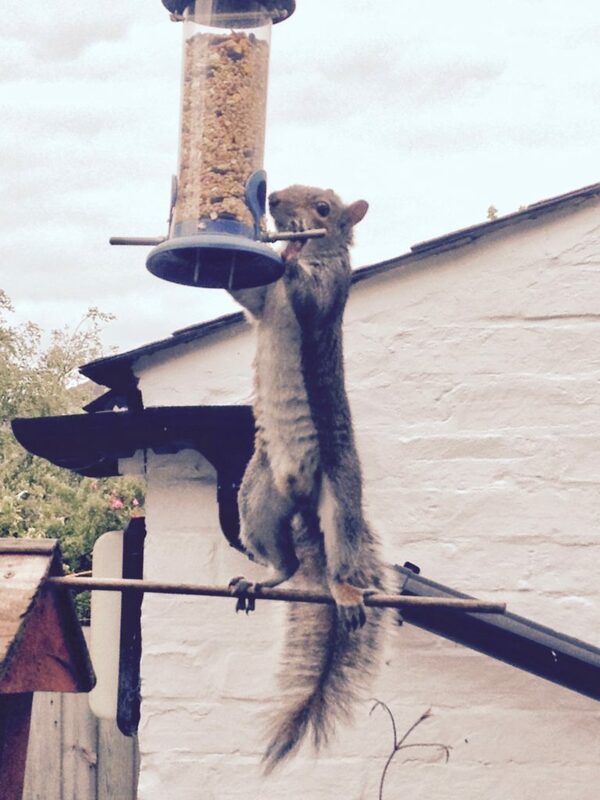 That’s supposed to be a BIRD-feeder! Which have you seen, recently? The RSPB bird identifier lists 408 species of birds found in the UK, including some rare overseas visitors. It’s simple to use – give it a try. I have today received the March edition of Mill Road News and am interested to read of sightings of foxes in the area. Some time ago, one day I was walking towards Mackay’s store in East Road and suddenly a little brown fox loped past me, so gracefully and confidently. As he neared the roundabout, to my horror, he suddenly plunged into the traffic to cross the road. I did not hear any squeal of brakes or scream, and so do hope he safely reached Elizabeth Bridge and the common after, apparently, a ‘night on the town’. Another time, when the Methodist Church [in Sturton Street] was standing redundant, late one night, I suddenly saw a fox cross the road and disappear behind the church building, but he made a quick sortie and then returned and trotted up the street townwards. I understood, later, that squatters had been sleeping behind the church until mattresses were discovered and removed by workmen. Probably the fox had previously found food there. We did see one once, in the rear gardens in the street, on the opposite side from the church premises. I was very interested to read of the dogs who go to run and play in the cemetery. I used to see them every morning, en route, when I fetched newspapers from the newsagents in Norfolk Street. Alas, the newsagents is no more and I am less mobile, so do not pass that way, and I do so miss seeing the dogs coming and going. One often carried his own frisbee toy, so I called him “Frisbee“. One day I was about to get out of a friend’s car and a man and dog walked by. I recognised the dog and said, “It’s Frisbee!“ And he ran back and jumped in the car onto me. Alas, he has now left the area (with his master). I have enjoyed reading about the foxes and the dogs. P.S. re: Horses in old Cambridge. The office complex in Sturton Street, called “The Courtyard” was originally the Co-op stable yard. Add your comments to the page, send us a piece to publish here, or a link to a great website which we ought to know about. re. squirrels: I watched a Come Dine With Me a while back and one of the dishes being served was squirrel. It seems not even covering their flesh in batter and frying made it palatable. I lose time watching them in my garden. They (more than 3 sometimes) seem to dare each other to get closer and closer to the cat flap. They and the cat know they’re not at threat!